It has been three and a half years since I read Sorcerer to the Crown and I was initially a bit worried about how much I remembered of the story and whether it would impact my experience with this sequel. 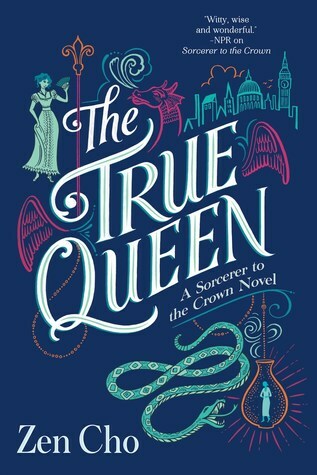 Happily, when the blurb to The True Queen became available, it appeared that the focus would be on a new set of characters. Indeed, while a few familiar names from the first book will crop up every now and again, indubitably the stars of the show here are a pair of sisters named Muna and Sakti. The girls’ journey together first began off the coast of the island of Janda Baik, after a storm washed the two of them ashore with no memory of who they were. The powerful witch and protector of the island, Mak Genggang, found them and took them in. Sakti, endowed with magic, immediately came under the witch’s tutelage, although that relationship remained strained. Muna, meanwhile, is magic-less, but has a much more favorable opinion of Mak Genggang. However, one day Sakti approaches Muna with irrefutable evidence that they have been cursed—in the middle of the former girl’s torso is a void that will keep spreading as she fades away. Desperate, the sisters take it upon themselves to identify who cast the curse, but instead they wind up nearly causing a diplomatic crisis. To smooth things over, Mak Genggang decides to send Sakti and Muna abroad to meet with Prunella Wythe, Britain’s new Sorcerer Royal, who has also opened a magical school for girls. There, they will present themselves as a pair of international students, but also search for more clues as to who cursed them. But unfortunately, the quickest way to their destination is through the dangerous realm of faerie, and while two girls departed Janda Baik, only Muna emerges safely on the other side in London and Sakti is feared lost forever. Similar to the first book, The True Queen explores the themes of racism and oppression. Apparently, despite the fact it is a woman who currently holds the prestigious office of Sorcerer Royal, attitudes towards women wielding magic have not changed that much since we last visited this world in Sorcerer to the Crown. “Proper ladies” simply did not involve themselves with the thaumaturgical arts, and thus even Prunella, who has come so far since the previous novel with her newfound wealth and status, still has to fight hard to be heard. And of course, this time we also have the perspective of a foreigner newly arrived in Regency-era Britain. Overwhelmed by the strange rigid rules of this hierarchical society, Muna finds herself simultaneously vaunted and condescended to by the upper class, and even those with the best intentions are sometimes guilty of prejudgment or lack of sensitivity. But in many ways, The True Queen is also a very different book than its predecessor. When it comes to the plot, I don’t know that it captured my attention with the same combination of unique aspects and magical allure as the first book did. Yes, the beginning sections intrigued me with the introduction of the vivid characters of Muna and Sakti and the fascinating story of how they ended up with Mak Genggang, followed by the kerfuffle in the faerie realm which resulted in Muna alone in England meeting with Prunella and the women of the magical school by herself. Likewise, the final chapters were hard to put down because of the drama and suspense surrounding the conclusion. Where I felt the story faltered, however, was everything in between. Pacing was part of the problem, which slowed as we switched tack from worrying about Sakti to focusing on the “fantasy of manners” elements of the world. In fact, one thing that really turned me off was the general lackadaisical attitude towards Sakti’s plight, and I was especially disappointed in Prunella and Henrietta’s dismissiveness and horrible bedside manner in response to Muna’s concerns. It’s also hard not to feel that Muna was the less interesting sister. From the start, it was clear Sakti was the more forceful personality, being more strong-willed and impulsive than her meeker and more pensive sibling. Even though Muna is the at the center of this story, she had a way of being overshadowed by the supporting characters. Overall, The True Queen was a solid read, even if it didn’t quite reach the heights of Sorcerer to the Crown. Simply put, there were no surprises this time around in that I found many elements of the plot predictable and the central character was probably the least interesting to me. That said, I had a good time catching up with some of the wonderful people I met in the first book and it was a delight to be back in this world. Yeah, plus the fact that this wasn’t a direct sequel, and thatit’s been so long between the books probably didn’t help! I won a copy of this off Goodreads but I have to read the first one first (which I ordered from Book Outlet). You have me quite intrigued. I couldn’t agree more with everything you said. About the sisters, the lack of concern from the people at the school and the slight pacing. I still enjoyed this but definitely not as much as the first. I still need to read this, and I am seeing mostly reviews that are less enthusiastic that Sorcerer to the Crown. Not having read that, I might have a better time overall with this. They were! I’m glad I tempered my expectations. Oh I know, the way Prunella et al treated poor Muna’s concerns was atrocious! I was furious at all of them! I’m glad I’m not the only one who felt this one dragged in places! Some of the middle sections were a total snoozefest. Yeah. The one thing I can’t stand is being bored while reading. Even if a book is terrible sometimes it’s still entertaining enough to keep you interested at least. But there’s no cure for being bored with a book. It sounds like a mixed bag of opinions for this one, looking at the comments left. Pretty cover though. I agree! The cover is quite lovely.